A fine, proportionately large manifestation crystal [1/4x 1/2"] is included in this Arkansas quartz cluster's largest point [3/4x 2"], along with foils and rainbows. A diamond window shows on the crystal to its' left, an extra prism face on the crystal next to that one - they're separated by an extended penetrator. 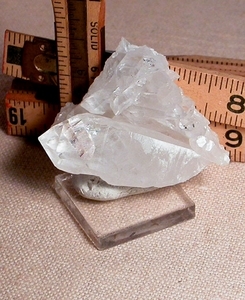 Other clear and translucent crystals have growth craters and more rainbows. There is one conchoidal chip. The after-calcite interestingly geometric base has portions of sparkling white drusy - looks like coral! 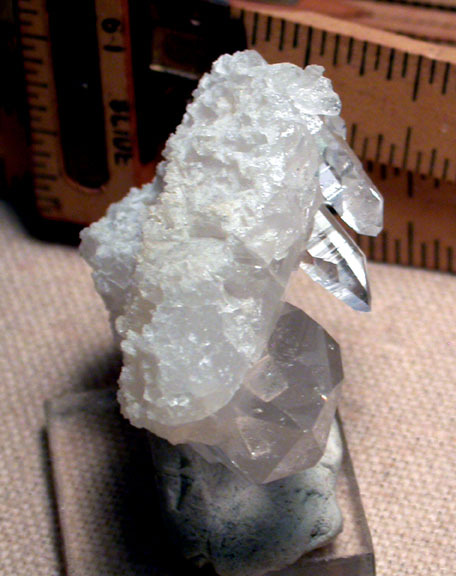 Measurements overall for this nearly triangular cluster are 2-1/4x 1-1/2x 1-1/8", miniature.